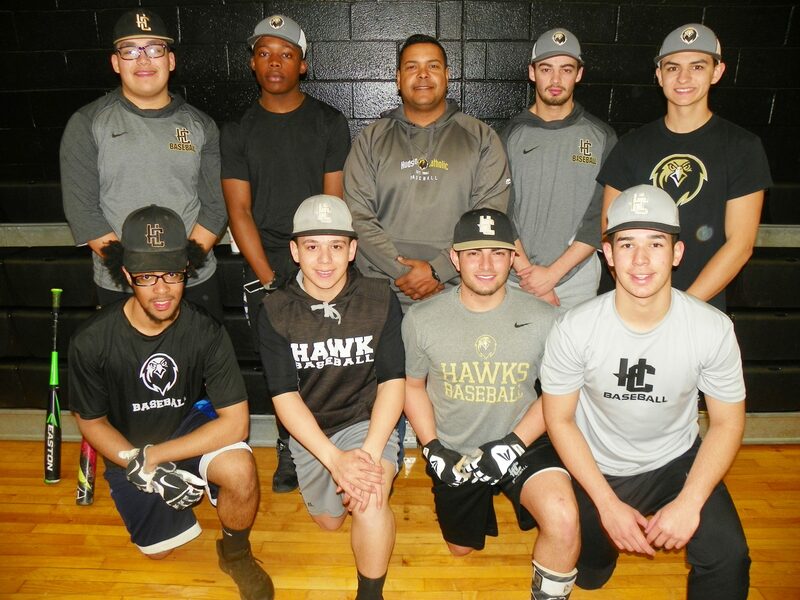 The Hudson Catholic baseball team will count heavily on its seniors in order to contend again this year. Front row, from left, are Anneury Familia, Kris Salinas, Tino Salgado and Joshua Ortiz. Back row, from left, are Ethan Lopez, Dewayne Sims, head coach Alberto Vasquez, A.J. Perrenod and Kris Jacobsen. The Hudson Catholic Regional High School baseball team should definitely be one of Hudson County’s premier squads again this season. That much is guaranteed. The Hawks are perennially contending for both Hudson County Tournament and NJSIAA Non-Public B North championships. But what isn’t a sure thing is the manner in which the Hawks will contend this spring. Veteran head coach Alberto Vasquez, a product of the Hudson Catholic program himself, has enjoyed immense success since he took over the program, including an overall state championship four years ago. Vasquez is hoping that a strong finish in 2018 can lead to a solid season in 2019. The Hawks are fortunate to have two intense and fierce competitors returning, two Hudson Reporter All-Area honorees in junior pitcher/first baseman Jimmy Kemp and senior shortstop Tino Salgado. Kemp was one of the area’s top two-way performers last season, winning five games on the mound with a stingy 0.89 earned run average and batting .440 at the plate. Salgado earned Hudson Reporter Player of the Year honors, batting an even .500 with 28 RBI. He has already signed a national letter of intent to attend the University of Rhode Island in the fall. Together, Kemp and Salgado form the county’s premier 1-2 punch. Vasquez has the same feeling about Salgado. Sophomore right-hander Allen Sanchez moves into the Hawks’ rotation. He is also a player to watch. It means that Vasquez puts Sanchez almost on the same plateau as Kemp. Junior right-hander Rafael Solano is another standout pitcher. He will serve as the team’s closer as well as the team’s No. 1 catcher. Senior Kris Salinas is another fine hurler for the Hawks. Junior Isiah Olmo is a left-hander who will get his chance to be a solid starter. Junior Ivan Gonzalez is a right-handed hurler. Senior Joshua Ortiz is another righty that Vasquez can call upon. “He’s going to get outs,” Vasquez said. Needless to say, Vasquez likes his pitching staff, especially since all six of the top hurlers have no problems throwing strikes. Solano is an excellent backstop, learning from the best, as Vasquez was a standout All-Area catcher with the Hawks and later Rutgers University and the New Jersey Jackals of independent baseball. Kemp plays first base when he’s not pitching. When he’s on the hill, junior Ethan Lopez takes over at first. Sanchez plays second base and when he pitches, Gonzalez takes over at second. Salgado is the fixture at shortstop. Just pencil him in at the top of the Hawks’ lineup and leave him alone. Salinas is the third baseman. Senior A.J. Perranod is the team’s resident jack-of-all-trades. Perranod, who had five RBI in the Hawks’ season-opening win over Lincoln, can play second base, third base, first base and slide behind the plate. Such versatility is hard to find. Junior Isaiah Decias is the left fielder. Senior Dewayne Sims is the team’s centerfielder. Senior Chris Jacobsen and junior Michael Santiago are sharing right field duties. Needless to say, the Hawks are ready for a solid run at county and state titles. “We’re ready to handle whatever comes,” Vasquez said.